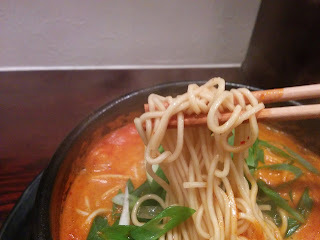 I've had motsu ramen and tsukemen before, chewy innards mixed in with soup and tare. 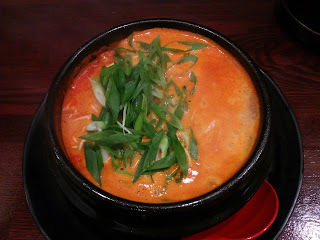 8910 Hakuju specializes in horumon ramen; another kind of ramen with offal. I had no idea what I was getting into, but with the choices of red, or white, I went with the spicier-sounding red. If I didn't enter a ramen shop for this blog, I would not have known what I ordered was ramen. It was fluorescent orange and came in a clay bowl. This is what I would expect if I ordered horumon nabe, or even a Korean hotpot. There was some good spice, but it was pretty salty too. The first taste or two were good, but with each bite the novelty wore off a bit. The noodles were thin, but so was the broth, so they were a good match. The melty if slightly chewy horumon was the highlight, as I would hope from a horumon specialty shop. This was a bowl I'm glad I had once, but it didn't quite last long enough for me to want to make a return trip. If you want something different, try this place.